This Irish Christmas ornament features intricate Celtic modeling. The hand crafted cold cast ornament is plated in bronze and carefully polished to highlight the elaborate detailing. This bronze plated Celtic cross ornament features a dimensional design with continuous knot-work and measures 3 1/4” tall x 2 1/2" wide x 3/8" thick. The Irish Christmas ornament is ready to hang on your tree with the included green ribbon and is gift boxed with Celtic knot and Celtic cross history cards, complements of The Irish Gift House. 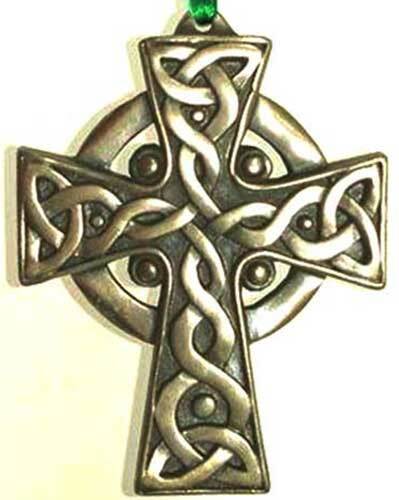 This bronze plated Irish ornament is made in Ireland by Celtic Shadows. Celtic cross Christmas ornament features an Irish home blessing along with a bronze plated finish.